In an interview to BBC Newsnight (25/8/2011) on the latest ONS figures on net migration in the UK, the Immigration minister, Damian Green, defending Cameron’s vision that the annual rate of net migration should be brought down to ‘the tens of thousands rather than the hundreds of thousands’, reiterates that the government will not lower its target on immigration. ‘It’s very important’ – he said – ‘we get immigration at a sustainable level, not just for our economy but for the wider health of society’. Pushing the medical metaphor even further, the minister also compares the dependency of the British economy on foreign workers to a drug addiction. This is nothing new. Elsewhere, he has blamed the previous Labour government for using taxpayer’s money on ineffective ‘palliatives’, instead of on preventive measures. What seems less clear is the diagnosis of the minister: what exactly is this alleged health threat faced by the country? From previous statements and speeches, it would seem that the threat consists of increasing public resentment, social stresses and strains, social conflict, and pressure on public services due to the mass arrival of immigrants in the UK. If this is the case, can the ‘net migration’ policy deliver? Let’s make a not-too-unrealistic hypothesis. As a result of the economic and financial downturn and of Osborne’s draconian cuts, the emigration of British workers towards countries which are adopting different economic responses to the global crisis reaches an unprecedented level. Moreover, due to the increase in university fees numerous British students decide to pursue their studies abroad. As a result of these events, next year the number of people that leaves the UK doubles. If one follows the ‘net migration’ argument, the government should then welcome a larger number of foreigners in the country without this causing social stresses and strains, social conflicts and pressure on public services. Obviously this wouldn’t be the case. 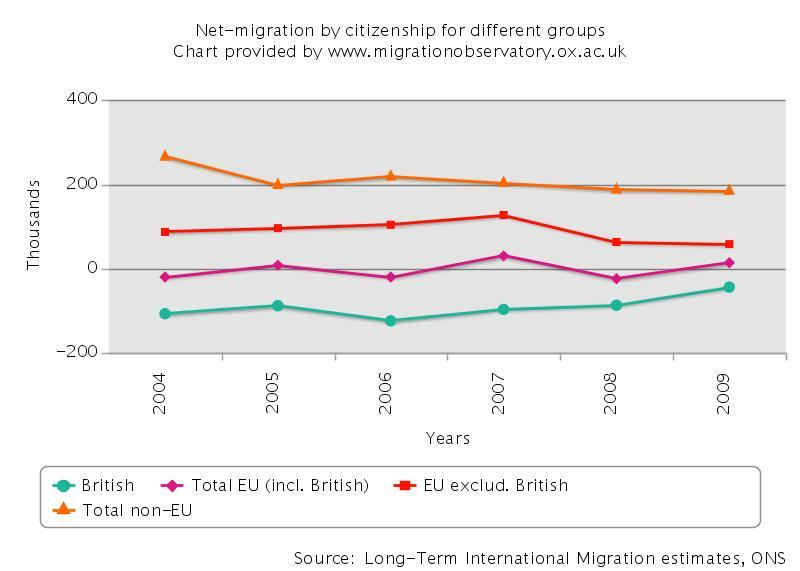 The problem, it seems to me, is that the way the government employs the ‘net migration’ indicator is misleading as it assumes a symmetry that is not there, failing to acknowledge the complexity of in- and out- migration flows and ultimately treating in- and out- migrants as passive goods which can be moved in a out of a warehouse with limited capacity. This entry was posted in migration and mobility, politics and tagged EU, immigration policy, international migration, net migration, UK. Bookmark the permalink.